On Saturday I was shopping in Big W (everyone has to sometimes) when I wandered by this aisle. What I saw made me stop to snap a photo with my shiny new phone because I was so excited. Put away those iPad dreams for a moment, because I think a whiteboard is just almost the best thesis tool that money can buy. Why? Because it can help you to think in novel and interesting ways. There’s a lot of thinking that has to go on during any research degree. Some of it is thinking through doing – such as the process of making things or conducting experiments. This is the kind of thinking artists and designers are more likely to wax lyrical about than scientists, but I would argue every discipline does it. The other kind of thinking is more reflective kind which mostly happens in and through the medium of writing. Sure, we may have the odd idea while in the shower, walking in the park or cooking, but these ideas generally need to find their way into writing in order to be tested out and developed further. One reason writing is such a good thinking tool is that it encourages us to think in a linear fashion – one word in front of the other. In this way we can build up ideas and chain them together in a coherent argument. In writing we can reflect on the ideas and add the evidence, definitions, side arguments and all the rest which our arguments weight and heft. This is a good thing – most of the time. But many people find they can only sustain a linear mode of writing for about 1500 words. Certainly this is the case for me. I can write about 2 pages at most before I have to stop and review where I am going. You may be able to go for longer – but inevitably, if you keep working words in a straight line, your writing will start to lose coherence. This is because stuck in the line by line, word by word business of writing it is easier to lose sight of overall purpose; how the part we are writing relates to the whole. I have never yet met anyone capable of writing a whole 90,000 thesis in this stream of consciousness / linear way (but feel free to write to me if you have!). To re-orient during the writing process most of us will stop to read back what we have written. The danger here is Editing. Too much editing at the initial drafting stage is, more often than not, the enemy of done. Robyn Owens, in the excellent (if badly named) ‘Doctorates Downunder’, calls this editing-as-you-go ‘the spiral method’ of writing. She warns that the spiral method, while good for creating coherence, can lead to the ‘one step forward, two steps back’ problem where work is done – but little real progress is made. You probably have experienced this: found yourself opening your document, tinkering around with paragraph number one for what seems like five minutes, then looking up to see it is already lunchtime. A whiteboard gives you a different kind of space to work your ideas; a way to draw back and seek out higher ground from which to survey your whole thesis or chapter. On a whiteboard you are not committed in quite the same way as you are in a word processor. Ideas seem more playful, tentative and open. Most importantly I think is that you can more easily draw diagrams which help you to arrange ideas in novel ways. Of course you can do this on paper, but on a whiteboard it is significantly easier to rub stuff out and move things around. 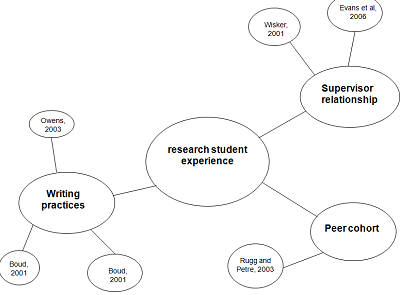 Here I started with a theme in the central bubble called ‘Research Student Experience’. The next step is to try literally ‘draw out’ sub themes or related ideas in new bubbles connected with ‘legs’ to the original bubble. The next set of ‘legs’ contain references to papers which talk about each of these aspects of the research experience. This diagramming method enables me to find relations between the ideas and the authors that I am reading – great for lit reviews. Each of the bubbles might simply translate to a subheading in your thesis. Then you can rub out the diagram – preferably after you have snapped a picture with your snazzy new phone so you have a record of your thinking. 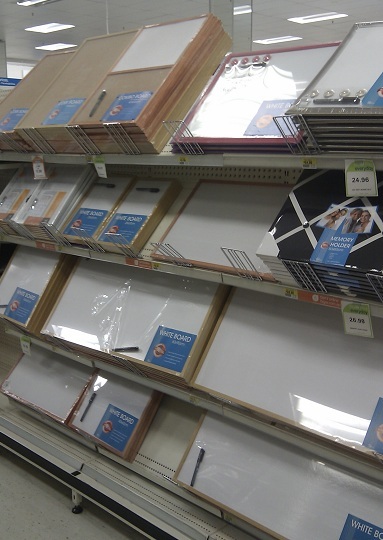 I would be interested to hear from others about uses for whiteboards in research practice – I’m sure there are many! « Are you addicted to your PhD? I love white boards as they allow me to do write my thoughts as you suggested. Unlike paper, I can stand back and view it as a large picture. Another technique I use when working out ideas is to use cue cards. I write one key word or concept per cue card (business size), and arrows or other symbols if requied. When they are done, I blutac them to my wall and move them around as needed. These two methods allow me to work out ideas over days, as well as provided less conscious opportunities for thinking due to their size. The other bonus occurs when family or friends visit. They ask about your conceptual work and you have a chance to explain it – an impromptu presentation! I remember your sticky wall! Do you have a pic? Oh Inger, I thought it was just me or my teaching background…. I have 2 whiteboards at home – the big one for PhD ideas and the little one for more slower PhD developing models. I also have a pretty big whiteboard that I carry around to meetings at work. Add 8 different colours of marker and good whiteboard cleaner and I’m in kid heaven! maybe it is a teacher thing 🙂 Do you express your phd model as a diagram? Of course, there are computer program that allow you to do too. Inspiration (for the Mac) is one I really like. But yes, the good old whiteboard is a great tool. Have you used these programs much? Can you recommend a good one? When I had an office, I used my whiteboard almost every day, and it was invaluable. Unfortunately, my current space doesn’t have anywhere to put one (well, I guess behind my computer and I could stand on the desk). There were two huge whiteboards in a skip in Bowen Street when I went home last night. Made me quite sad seeing them being thrown out. we should start a whiteboard rescue society! In 2008 Glen Iris Primary had an empty classroom…what if … I wondered… if teachers could use the room, without taking books and pens. No paper. A paperless classroom! What if spare tables were dragged from under the school and laminated with whiteboard material? Would it offer students the opportunity to begin work immediately using whiteboard markers and plan, design, modify and create! The idea buzzed around the staffroom and took off! An Interactive Whiteboard had been previously installed in the classroom and with furniture needed elsewhere there were few distractions – the room was clutterfree – no bookcases, shelves and brightly covered pin boards. Paper was kept to a minimum – although somehow the Paper Recyling Bin found its way into a corner because of the extra space. Many of our students delighted in pointing out the incongruence of a paper bin in a paperless classroom! Named ‘Thinking’ Tables students could write on our tables with whiteboard markers. All tables were kept to the side of the room so that classes could chose to sit on the floor first for circle time or other cooperative team activities. Chairs remained stacked at the side and students could chose to take one to sit on or remain standing. Some students chose to use the teacher’s whiteboard at the front of the room and stand, moving only when they needed to see the IWB, join a discussion or negotiate with other groups. Whiteboard Thinking Table work, was characterized by a buzz of activity and a high level of intrinsic motivation. Students were keen to commit their thoughts to the tables, knowing that they were easily erased as they work through problem solving processes. Low achievers worked without fear of making mistakes. Where is the paperless classroom now? Our school grew and the classroom was needed but some Thinking Tables are used in classroom and other schools have adopted the idea. I’m in the spiral! – someone throw me a whiteboard! i’m a big fan of whiteboards too – ever since i was a child i have loved scribbling on walls! (in the last place i lived we had white tiles in several rooms and kept whiteboard markers all round the house so we could scribble anywhere we got the urge) for some time i have been taking digital happy snaps of my whiteboards before erasing my spider diagrams – lately i have found that i can upload them to evernote (which is unfortunately proprietary – but it has a free service) and it reads (much of) my abysmal handwriting so that my whiteboards are now searchable! i find this makes it easier to browse related whiteboard images while i’m thinking and making connections and revisit those sprawly thought processes in a flexible way. for some people it’s the ephemerality that makes the whiteboard great, but for me being able to incorporate the gestural scribbly thinking processes that the whiteboard allows into my digital workflow has been very nice, so i thought i’d share.